The poets and writers featured in this book represent the diversity of our country as well as voices beyond our borders, including Maya Angelou, W. H. Auden, Danez Smith, Rumi, Emily Dickinson, Naomi Shihab Nye, Alice Walker, Adam Zagajewski, Langston Hughes, Wendell Berry, Anna Akhmatova, Yehuda Amichai, and Robert Frost. The book opens with a stunning foreword by Elizabeth Alexander, whose poem “Praise Song for the Day,” delivered at the inauguration of President Barack Obama, ushered in an era of optimism. 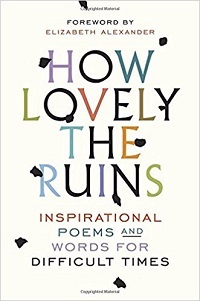 In works celebrating our capacity for compassion, our patriotism, our right to protest, and our ability to persevere, How Lovely the Ruins is a beacon that illuminates our shared humanity, allowing us connection in a fractured world.